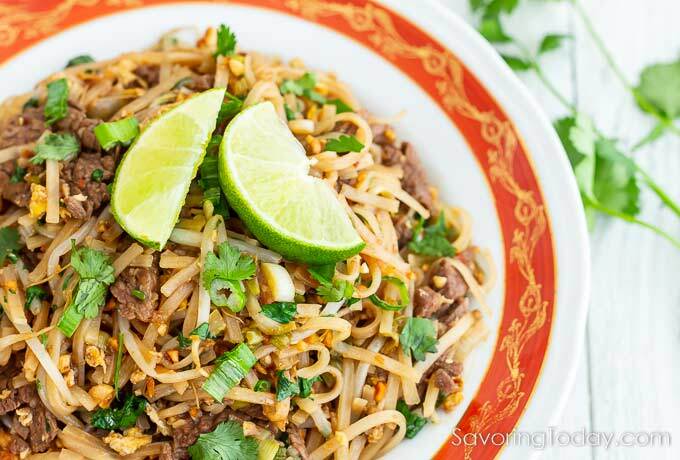 Beef Pad Thai is an easy recipe to make at home! Add beef or any favorite protein and balance the spice to your preference. When writing about Emeril’s Wok Seared Duck Salad, his recommendation for fish sauce was included in the ingredient list. Shortly after posting the Duck Salad recipe, Red Boat Fish Sauce sent me a sample of their sauce to compare. Starting with Shrimp Lo Mein, this fish sauce provided a clean, bright flavor that melded perfectly into the sauce without being too salty or fishy. We tried it in Pad Thai with Beef (below) as well as Pad Thai with Shrimp, and again, it brought a balanced dimension of savory flavor. I was equally pleased to discover this new sauce has so few ingredients—just anchovies and sea salt. Quality ingredients make a difference. Additives like hydrolyzed vegetable protein is commonly used in commercial fish sauces as a short cut to enhance flavor. This is a concern for anyone trying to avoid gluten and still enjoy Asian foods. We cannot always be sure about the ingredients used in restaurants, but at home, I use pure, whole ingredients as close to the natural source as possible. I look for products like Red Boat to add to my pantry because quality ingredients make a difference in taste and eliminating unnecessary additives from our food is important to us. Look for Red Boat Fish Sauce at Whole Foods Market or order online. 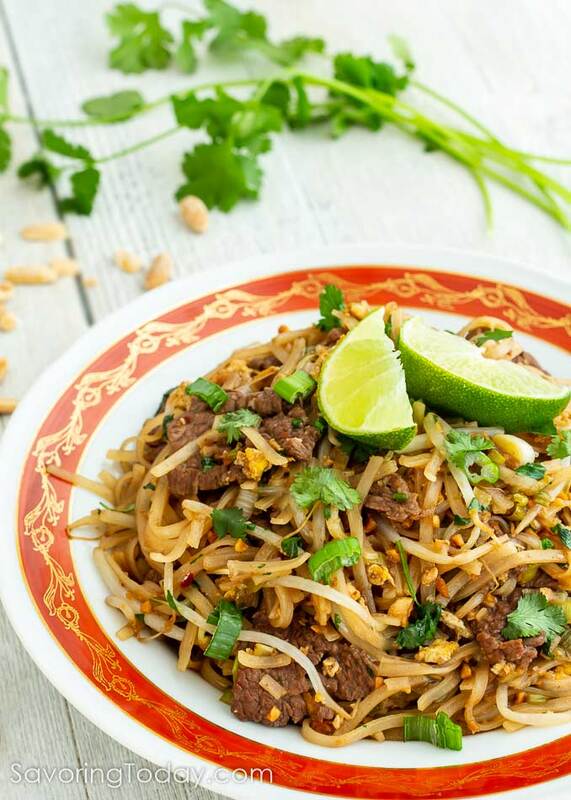 A bed of rice noodles and tender strips of beef coated with the savory flavors of tamarind, garlic and fish sauce, flecked with peanuts and cilantro. In a large bowl, combine the noodles with enough warm water to cover. Soak until just tender, about 30 minutes, then drain and set aside. Or follow package directions. Using a small bowl, combine the fish sauce, vinegar, tamarind paste, crushed red pepper, and sugar; stir until the tamarind paste and sugar dissolves and is well blended. Set aside. Heat the oil over medium-high heat in a large skillet or wok. Add the garlic, and cook, stirring, for 30 seconds or just fragrant. Stir in the meat and cook until the just cooked through, about 2 minutes. Transfer to a plate and cover to keep warm. In the same skillet, cook the eggs about 1 minute, stirring to break up into small pieces. Add the white part of the onions and cook for 2 minutes to soften. Stir in the sprouts, Bonito flakes, green part of the onions, fish sauce mixture, and noodles, and cook until mixed well and warmed through, stirring frequently. Taste, and sprinkle in more Bonito flakes, as desired. Toss in the reserved meat and peanuts, and cook for 30 seconds to incorporate into the noodles. Sprinkle with the cilantro and lime juice; serve immediately with lime wedges and Sriracha sauce on the side. Dried Bonito flakes, known as katsuo-bushi or katsuobushi in Japanese cuisine, are thin flakes of dried, smoked bonito fish. Like dried shrimp or shrimp paste (often used in Pad Thai), bonito flakes add a savory flavor to any dish. Bonito flakes were easier to find than dried shrimp or paste in our area. Bonito is sliced so thinly it melts into soups, sauces, or stews for a umami flavor boost. This post contains affiliate links. For more information regarding ads and advertising affiliations, please see our Disclosure Policy. I haven’t used fish sauce a lot, it’s nice to know what to look for. Thanks. In Thailand, Phat Thai with shrimps or pork are the most common kind. It’s one of the most popular lunch dish here. Your pad thai looks delicious. I agree, one the things I like most about cooking from scratch is complete control over the ingredients! Thank you for sharing it with the Hearth and Soul Hop. Your speaking my language with this recipe and the squirt of lime is not optional for me. Well done with that pad thai, thats one of the hardest noodles to cook. 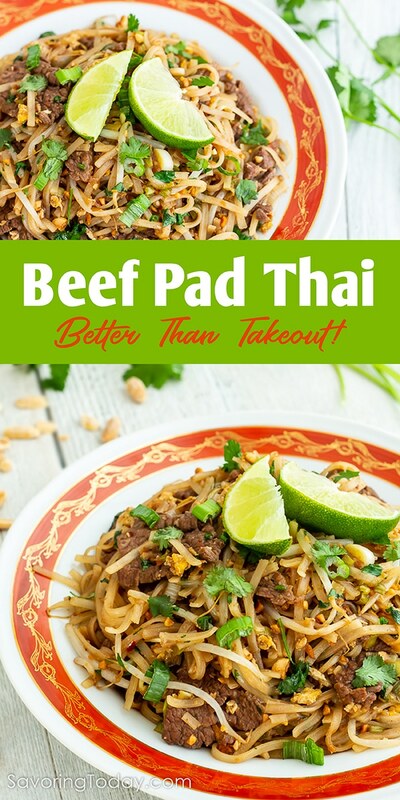 I love pad thai- this looks delicious! You gotta have the squirt of lime!!! Pad thai is my favorite Thai dish but I’ve never tried to make it. I really should try this recipe. Excellent job. Thanks for sharing. I adore pad thai – yours sounds really really delicious, it looks it too. This looks fantastic and the lime wouldn’t be optional for me. I love this dish and have never made it. Lime isn’t optional for me either, can’t imagine Pad Thai without that extra squirt of lime just before diving in!